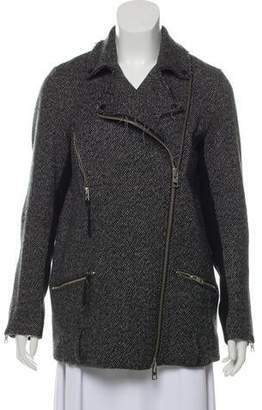 ALLSAINTS Check Coat in Black. - size S (also in M,L) ALLSAINTS Check Coat in Black. - size S (also in M,L) Self: 50% wool 50% poly Body Lining: 63% viscose 37% cottonSleeve Lining: 100% polyInner Panel: 80% wool 20% polyamide. Dry clean only. Front button closure. Front flap pockets. Contrast lapels. Made in Turkey. ALLR-WO4. W0129P.